Can be fished in shallow water. Damsel fly nymph color varies from lake to lake. 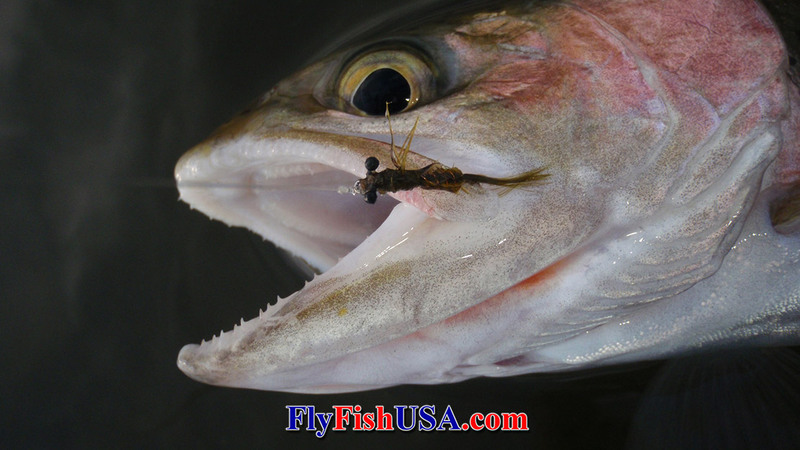 The long, sparse marabou tail gives this fly a swimming action. It can look like several differene stillwater orgnisms. Fish this fly very slowly. First thing in the spring, use a floating & long leader in very shallow water. 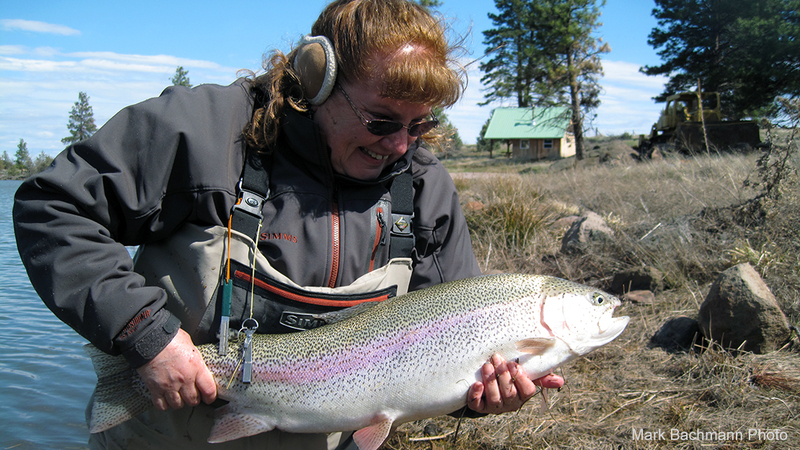 Patty Barnes and a beautiful rainbow caught on a damselfly nymph. Damselflies are those delicate iridescent blue or red insects that you see flying around lakes and ponds. In the nymphal stage they range from olive to tan, are free swimming and often exposed to cruising trout. Bass and panfish will also feed heavily on damselfly nymphs. Damselfly nymphs are strong swimmers. While swimming the body of the nymph undulates very much like a fish. When hunting for food, nymphs usually swim in short erratic bursts at a slight upward angle and then slowly settle while they rest. This swimming motion is fairly violent, but only carries the nymph a few inches. This action is very noticeable and is a definite key. Your retrieve should duplicate this swimming movement. Smaller, early season, immature nymphs are usually light olive green. Fishing a damselfly nymph very slowly, within inches of the bottom with a sinking fly line is often productive. Since the water can be cold this time of the year, the strikes can be very soft. Every angler has to stay alert. During May and early June, the water starts to warm. Predacious damselfly nymphs hunt vigorously in, around, and under water vegetation. They become a staple fish food. Fishing a Damsel Fly Nymph within inches of the weed tops can bring savage strikes. The fly must be fished slowly. 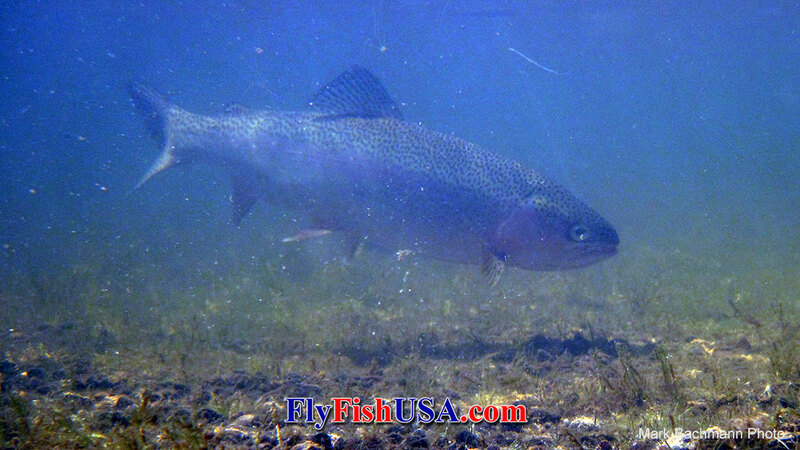 Damsels are most vulnerable to trout during their migration to hatch on above-surface structure. In lakes such as Crane Prairie, damsels can migrate in such masses that they can create nervous water like miniature moving shoals of fish. The trout can become so gorged as to become very difficult to catch. The fish will key only on cripples. 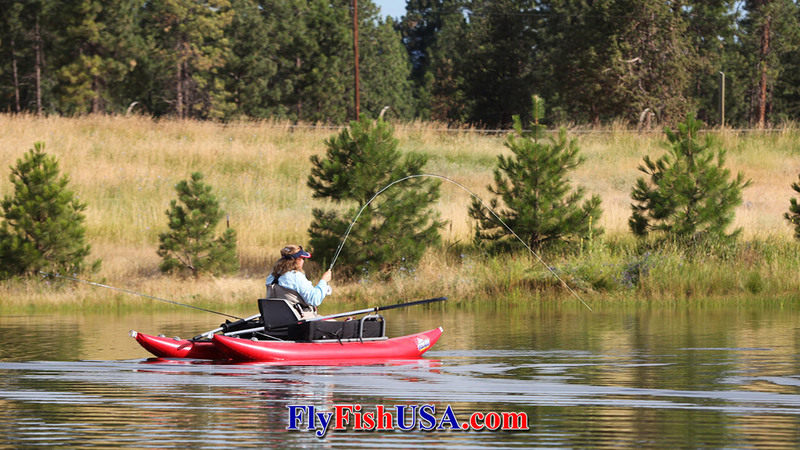 During these times, try a Picky Fish Damsel retrieved very slowly, just under the surface, or dress the foam wing case with floatant and fish it dead in the surface film like a dry fly. Very long leaders with fluorocarbon tippets will get the most takes. Target fish that are cruising.